A change of 44F is the same as a change of 7C? Now, I'm not as savvy at converting from Celsius to Fahrenheit as Kate Nowak, but even I knew this was some faulty converting by a marketing department. No. I take that back. I admit, they did the conversion fairly well. 44F is indeed (approximately) equal to 7C. But a change of 44F and a change of 7C? That's a little different. Couldn't they just have tried an example? One example. That's all I ask. Like, take two numbers whose change is 7, say 0C and 7C. 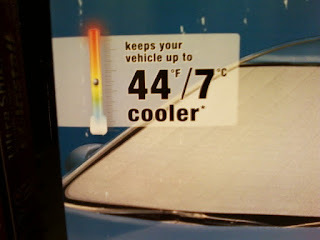 Covert those to Fahrenheit (32F and 45F, respectively), and you'd see right away--that's not a 44 degree change. Check for the reasonableness of your answer, as I tell my students. So, what is a change of 7C equal to in Fahrenheit? Let's do a little algebra! In other words, the change in Fahrenheit, is equal to 9/5 times the change in Celsius. Which means that a change of 7C is only equal to a change of 12.6F, a far cry from 44F, in my opinion. And this verifies the consistency of our example that we tried earlier. Which is good since this is a linear function we're talking about. No change in slope here. So, which is it? 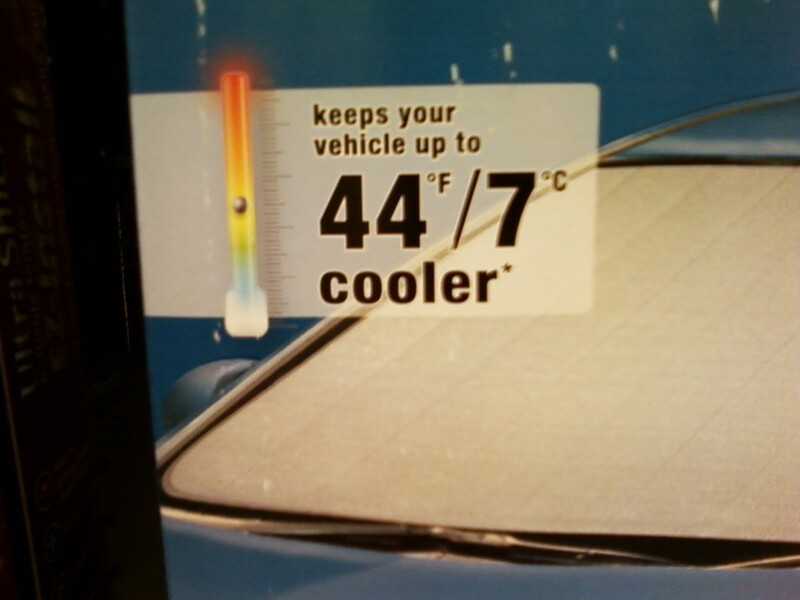 Does this sun shade keep our vehicles up to 7C (12.6F) cooler, or 44F cooler? Maybe we just get to choose. This can be changed from an algebra problem to a calculus problem rather nicely. I think this would be a lovely introduction to using differentials as approximations for actual change (or in this case, since the function is linear, the differential will be equal to the true change). Step 1: Give the kids the function for F with respect C.
Step 3: Show them the picture at the top. Step 4: Watch them pee their pants (they're math nerds too, right?). 9th year teacher. Currently teaching AP Calculus AB and PreCalculus/Trig. How often do I do math?